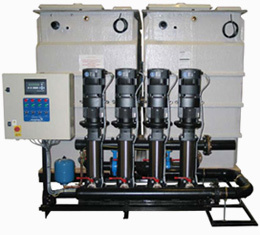 Megaboosters and Compact boosters are above-ground pumping and storage units comprising large-capacity water storage and mulitple pump sets. Megaboosters are for very large developments and Compact boosters are for medium to large projects. All large booster units are delivered to site in manageable pre-assembled sections, which are then simply reconnected on site to leave the whole assembly ready to use. A heavy-duty steel framework unifies the tank and pumps into a single unit. The GRP storage may be divided into more compartments if required and comes with internal and external ladders where necessary. Storage capacities, physical proportions and pump performances are designed in co-operation with our technical specialists to specifically suit site requirements. 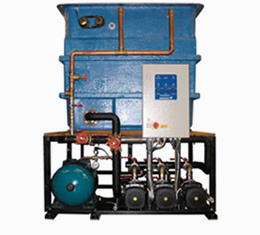 With the pumps below the tank, the footprint sizes of compact units are very small.